We are used to our comfortable paved roads that lead us to many places in our Liguria but, until just over a century ago, things were not so. The ancient AURELIA road ends in Vado, near Savona. The Roman Empire took care of the road only on the mountains behind the coast, for the transit of its military contingents, the coastal areas routinely used boats for ordinary trips, because the terrestrial transit routes were very uncomfortable. After the Roman Empire - until the unification of Italy and the construction of the railway (in the second half of 1800) - the chronicles tell us about ships that stopped near the coast, to allow the crew to reach land on boats, to come and dissolve a vow to the Madonna di Pia, after having saved from a shipwreck or some great danger. 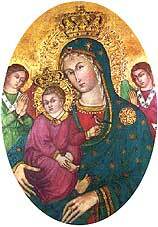 We know that - besides Clemente VII - at least two other Popes came to the feet of the Madonna di Pia. Innocent IV (former bishop of Albenga) arrived there in a litter, while crossing Liguria, returning from Lyon to Rome, in 1251. Also the successor of Clement VII himself, the almost ninety-year-old Paul III arrived there in 1538. We report a suggestive chronicle of the visit of Pope Clement VII, who was nephew of the famous Lorenzo the Magnificent (+1492). In 1533, when he had to go to Marseilles from Rome, for the marriage of his great-granddaughter, Catherine de Medici, with the duke of Orleans, son of Francis I, king of France, and for other important Church affairs, he decided to seize that propitious occasion, to venerate the Blessed Virgin of Pia. 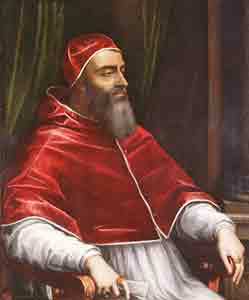 He moved from Rome on September 9th to Pisa, accompanied by ten cardinals, by many prelates, and by his numerous court. Upon his arrival in Pisa, embarked on the flagship of France, he gave the signal of the parade of the numerous galleys and for departure. At dawn on October 6, finding the fleets in front of the Finale, the Pope ordered that all entered the bay, longing to take land, to go and venerate the miraculous effigy of Maria Pia, of whom he had heard many extraordinary prodigies, operated for those who trusted her with recourse. At the appearance of many paved galleys, at the beach, the Carretteschi (the subjects of the Marquis Del Carretto) with all the inhabitants, poured out on the marina, eager to know the reason for such an unusual spectacle. Hearing that it was the Supreme Pontiff who went there to visit Maria Pia, they proved unspeakable. Landed, the Pope with his noble court and the general staff of the fleets, they soon set off for the Shrine, accompanied by the Del Carretto family, by the clergy and by the people among songs and ovations. 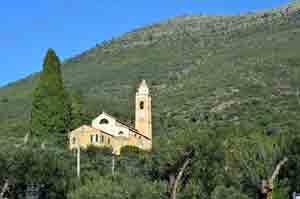 To welcome the Supreme Pontiff there was the then Prior of the Olivetan Monks of the Monastery of Finalpia, Fra Angelo di Albenga. Born in Salea, hamlet of Albenga (c. 1487), he had entered the Olivetans in Finalpia, he had taken the Olivetan dress (March 21, 1502), to become a monk the following year. He became a priest March 21, 1511, he was elected Prior to Finalpia 3 times (1518-23, 1525-27, 1532-34). In 1533 he must therefore have been about 45 years old. It would then become, in two years, the First Abbot of Finalpia. When Clement VII arrived at the foot of the venerable effigy of the Virgin Mother, he prayed it a long time and with great fervor, to obtain from the divine Son, a prosperous and happy outcome to the enterprises he had by hand; and the like made his following. But let's leave aside the ancient chronicles and come to our days. This year, on August 14th 2018, an effigy of the Madonna Pia will arrive from the sea. We are grateful to the generous and professional service of the COMPANY OF SAN PIETRO DI FINALMARINA, for the first time - in the many centuries of its history - an effigy of MADONNA DI PIA will arrive to us from the sea, right on a boat with its 4 good oarsmen. The departure from the Port of Finale will take place at 20.30. All the way will be accompanied by canoes and boats from the LEGA NAVALE DI FINALE. The arrival of the maritime procession on the beach of Finalpia is scheduled around 21.00.